In times of increased personal mobility, air-pollution in large cities and urban areas is becoming a major problem for public health. One possible solution is to equip vehicles with low emission and thus less polluting engines. Hydrogen fuel cells are one of those alternatives in discussion and first prototypes have been developed. A hydrogen fuel cell is a so-called electrochemical cell. It produces electrical energy from a chemical reaction, in this case the combination of hydrogen and oxygen to pure water. A car with such a fuel cell would cause no pollution because its only waste product would be pure water. A major drawback of hydrogen fuel cells is the energy intensive production of its main fuel, hydrogen. Hydrogen is usually produced by splitting water in hydrogen and oxygen which usually takes a lot of energy. To make the hydrogen production more efficient, researchers have been working on new catalysts, i.e., compounds that lower the energy barrier of a chemical reaction to make it more efficient. The team from Charles University in Prague, CNR-IOM in Trieste, and NIMS in Tsukuba including researchers from the CERIC Czech Representing Entity, Charles University, made an important step toward better catalysts. They investigated the behaviour of Cerium Oxide (ceria), a common catalyst for many commercial applications, in water-rich environment. In particular, they paid special attention to the role of the oxygen vacancies, i.e., holes, within the ceria catalyst in the reaction with water. 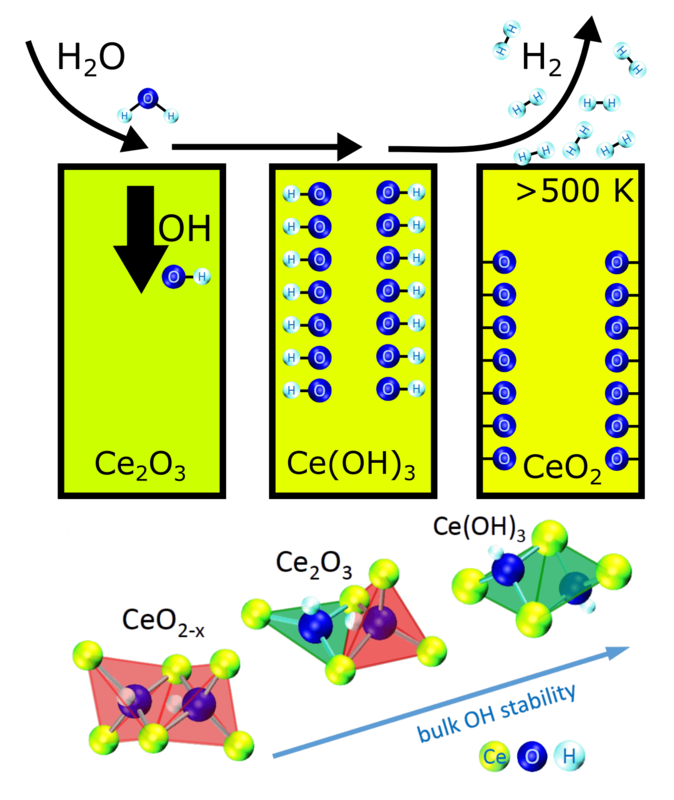 The scientists compared the performance of different types of Cerium Oxide with various stoichiometry (from CeO2 to Ce2O3) in hydrogen production by water splitting. It turned out that the hydrogen production rate increases with increasing amount of oxygen vacancies in ceria. The tremendous increase of hydrogen production was observed on Ce2O3. To understand the reason behind this behaviour, scientists combined surface science experiments at CERIC Surface Physics Laboratory in Prague and at CERIC Materials Science Beamline in Trieste with theoretical calculations performed at CNR-IOM DEMOCRITOS and GREEN NIMS. They found out that Ce2O3 contains specifically ordered oxygen vacancies (next-nearest neighbour vacancies), which allow splitting of water molecules and bulk incorporation of formed hydroxyl groups (OH). Once incorporated, the hydroxyl groups in bulk of ceria represent massive source of hydrogen, which is released as a result of thermal treatment while the remaining oxygen oxidizes the ceria. These results illustrate that the spatial coordination of oxygen vacancies in ceria is an important parameter to be considered in understanding and improving the reactivity of ceria-based catalysts for the production of hydrogen as a clean fuel. The research was performed within CERIC internal research project CEROP.